French civil engineer who specialized in metal structures, known especially for the Eiffel Tower in Paris, iron bridges and the framework within the Statue of Liberty in New York harbor. Being the most striking manifestation of the art of metal structures by which our engineers have shown in Europe, it [the Eiffel Tower] is one of the most striking of our modern national genius. English version by Webmaster using Google Translate, from the original French, “Étant la plus saisissante manifestation de l’art des constructions métalliques par lesquelles nos ingénieurs se sont illustrés en Europe, elle est une des formes les plus frappantes de notre génie national moderne.” From interview of Eiffel by Paul Bourde, in the newspaper Le Temps (14 Feb 1887). Reprinted in 'Au Jour le Jour: Les Artistes Contre la Tour Eiffel', Gazette Anecdotique, Littéraire, Artistique et Bibliographique (Feb 1887), 126, and in Gustave Eiffel, Travaux Scientifiques Exécutés à la Tour de 300 Mètres de 1889 à 1900 (1900), 14. Also quoted in review of the Gustave Eiffel’s book La Tour Eiffel (1902), in Nature (30 Jan 1902), 65, 292. Attributed. In Peter Yapp, The Travellers' Dictionary of Quotation: Who Said What, About Where? (1983), 183. It seems to me that it had no other rationale than to show that we are not simply the country of entertainers, but also that of engineers and builders called from across the world to build bridges, viaducts, stations and major monuments of modern industry, the Eiffel Tower deserves to be treated with more consideration. English version by Webmaster using Google Translate, from the original French, “Il me semble que, n’eût elle pas d’autre raison d’être que de montrer que nous ne sommes pas simplement le pays des amuseurs, mais aussi celui des ingénieurs et des constructeurs qu’on appelle de toutes les régions du monde pour édifier les ponts, les viaducs, les gares et les grands monuments de l’industrie moderne, la Tour Eiffel mériterait d’être traitée avec plus de consideration.” From interview of Eiffel by Paul Bourde, in the newspaper Le Temps (14 Feb 1887). Reprinted in 'Au Jour le Jour: Les Artistes Contre la Tour Eiffel', Gazette Anecdotique, Littéraire, Artistique et Bibliographique (Feb 1887), 126-127, and in Gustave Eiffel, Travaux Scientifiques Exécutés à la Tour de 300 Mètres de 1889 à 1900 (1900), 16. Also quoted in review of the Gustave Eiffel’s book La Tour Eiffel (1902), in Nature (30 Jan 1902), 65, 292. The first principle of architectural beauty is that the essential lines of a construction be determined by a perfect appropriateness to its use. 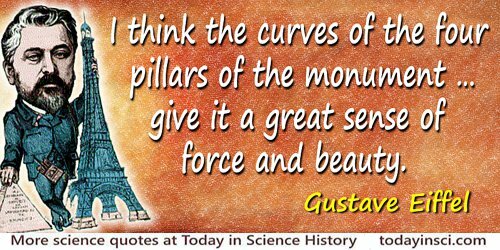 Well, I think the curves of the four pillars of the monument, as the calculations have provided them,… give it a great sense of force and beauty. From the original French, “Eh bien! je prétends que les courbes des quatre arêtes du monument, telles que le calcul les a fournies,… donneront une grand impression de force et de beauté,” in interview with Paul Bourde, in the newspaper Le Temps (14 Feb 1887), rebutting the protestations of many artists against the tower. Reprinted in 'Au Jour le Jour: Les Artistes Contre la Tour Eiffel', Gazette Anecdotique, Littéraire, Artistique et Bibliographique (Feb 1887), 126, and in Gustave Eiffel, Travaux Scientifiques Exécutés à la Tour de 300 Mètres de 1889 à 1900 (1900), 13-14. Also an epigraph, in French and with English translation, in Horst Hamann, Paris Vertical, (2004, 2006), 26. [It has been ascertained by statistical observation that in engineering enterprises one man is killed for every million francs that is spent on the works.] Supposing you have to build a bridge at an expense of one hundred million francs, you must be prepared for the death of one hundred men. 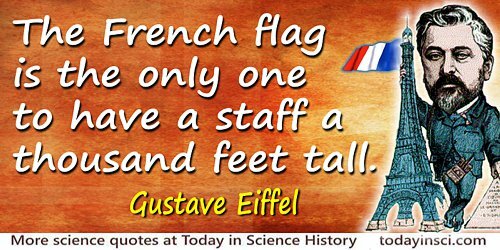 In building the Eiffel Tower, which was a construction costing six million and a half, we only lost four men, thus remaining below the average. In the construction of the Forth Bridge, 55 men were lost in over 45,000,000 francs’ worth of work. That would appear to be a large number according to the general rule, but when the special risks are remembered, this number shows as a very small one. As quoted in 'M. Eiffel and the Forth Bridge', The Tablet (15 Mar 1890), 75, 400. Similarly quoted in Robert Harborough Sherard, Twenty Years in Paris: Being Some Recollections of a Literary Life (1905), 169, which adds to the end “, and reflects very great credit on the engineers for the precautions which they took on behalf of their men.” Sherard gave the context that Eiffel was at the inauguration [4 Mar 1890] of the Forth Bridge, and gave this compliment when conversing there with the Prince of Wales. 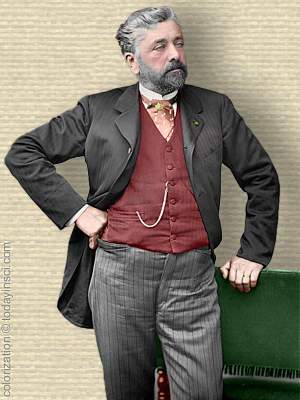 15 Dec - short biography, births, deaths and events on date of Eiffel's birth. Eiffel: The Genius Who Reinvented Himself, by David I. Harvie. - book suggestion.